This post is inspired by Aaron Davis’ personal post from his blog www.readwriterespond.com (you can find the post here). Aaron and I have collaborated right throughout 2014 through a combination of face to face catch ups, Google Hangouts and online banter. Through this collaboration, we have grown to know each other’s professional persona really well but Aaron’s post really highlighted the need for connected educators to share more of their whole self online instead of just their professional online persona. I have to say that I began on Twitter with the sole purpose of creating a separation between my personal online footprint (Facebook, etc…) and my professional profile. Honestly I liked it this way initially but over time I did feel like it was a double life. I guess this is the challenge of online networking. I have let my personal life spill into some of my posts from time to time but as I become more comfortable writing online, I feel I open up more and more. This story is my most personal. 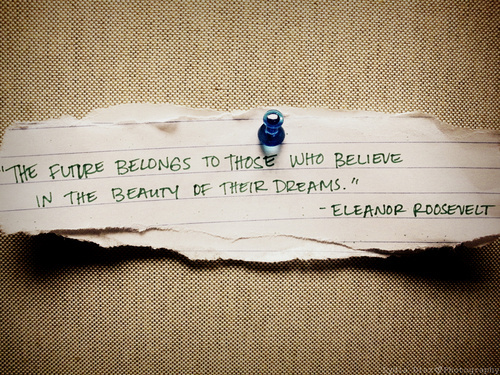 The quote above is by Eleanor Roosevelt and until 2006 would have never registered on my personal radar at all. It was listed next to my brother’s photo in his Senior Year high school yearbook. Kev had moved to Savannah, Georgia as a 17 year old to chase his dream of playing college basketball in the US. He would attend prom, be crowned prom king, star in his high school basketball team and achieve his dream of playing college basketball by playing for the University of Georgia Bulldogs, a Division 1 school in the NCAA. The song title of one of our favourite band’s The Postal Service sums it up best, “Such Great Heights”. The power of Kev’s journey was that he had believed in this dream since he was four and had worked his tail off since then to achieve his goal. He faced rejection on numerous occasions but never let it deter him from believing in the beauty of his dream. Kev was cut from the Under 18 Victorian State team as a bottom age player along with another player by the name of Andrew Bogut. I attended one of their practice games during the tryouts where Kev scored 26 in a quarter and Bogut scored 40 points for the game (and they got cut, go figure huh!!!). In his Junior year at Savannah, Kev would break school records at Memorial Day High School in so many categories and would take his school all the way to the State Championship. His success did not sit well with other schools so they questioned his age and even though he was only 18, he was made to sit out his Senior year of high school, the year that college scouts are looking for the next prized recruit. In his year of ineligibility, Kev would not let them take his dream away and took on the role of assistant coach and would help coach his team to another successful year as well as work to keep his skills and fitness up. He sent tapes of his games and practice sessions to coaches all throughout the state of Georgia and had received some interest. The Athletic Director of his school who we lovingly called Kev’s “American Dad” never stopped believing in him and rang around to all the college coaches that he knew to talk about this amazing Aussie kid that he had playing for him. Kev would be offered a place at Armstrong University, a reputable Division II college in Georgia but he would forgo this for the opportunity to try out as a “walk on” for the University of Georgia. A “walk on” is basically an open trial for anyone who attends the University. He decided that it was better to take the big risk and go for his dream instead of the safe path. 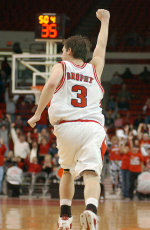 Kev would be successful in walking on for Georgia and played a pivotal part in the success of a young Georgia team in his freshman year. As you can imagine, we were so proud. The great thing about Kev was that he was so level headed and down to earth. He came home after such a great year and dropped into my school to run basketball clinics for my Year 3/4 students and to talk to the Year 5/6 students about believing in their dreams. They drank up every word. He just had that presence! Kev’s second year at Georgia was not as glamorous as his first as the next batch of fresh recruits had came through and cut his playing time down. This would only steel Kev’s resolve and he would work harder. He never harboured any resentment towards these new players and in fact would became their mentors on the team. Over the break between his sophomore and junior years, Kev would work harder than he ever had on his game and his fitness. His leadership was to be recognised by his naming as team captain for his junior year. The sad part is that Kev would never see this occur. On his way back from a basketball clinic for under privileged kids in Athens Georgia, Kev would be killed instantly in a car accident at the age of 21. My world stood still…. This post is not about a sad story but more about a life lived to the fullest. It is amazing the pockets of a person’s life that come to fruition when they pass. They live in so many worlds and have such different relationships in each. Kev’s high school year book would come our way a few months after his passing. I just looked at the quote and cried. Wow…this had been written two years before he passed. During such times of sadness, we grab onto any life raft to get us through and this quote was on my raft. I am a dreamer and I have alway loved the vastness and power of my dreams. Too often in life we place our own obstacles in the way of our dreams, be it excuses, time, etc…I say to you, no more! Take that great idea, challenge, relationship, learning that you should do and “just do it”. The world needs dreamers and doers and the best is the combination of both. I have lived every year in my life since 2006 as if it was my last. I implore you to reach for the stars, to enjoy the ride the whole way and believe in the beauty of your dreams! I think that one of the most challenging aspects of blogging (and writing in general) is finding ‘your voice’. I think that trying to create a divide limits this as it restricts your ability to truly speak. I too perpetuated the supposed personal and professional divide. I think it is so important in some respect to be personal to be truly professional. This maybe an experience or a failure. This post is a fantastic reminder that life is too short to wait for I don’t know what. Someone else to do the work? Someone else to drive the change? Thank you so much for sharing. There is always so much we don’t know and that is ok. I remember a heated and passionate #beerpedagogy debate between several of us about the blend and crossover between our professional and personal lives. Thank you Steve for sharing this personal story. At a time when we can be blinded by the obstacles and road blocks in front of us we need to be reminded that time is not infinite in its supply; that we should not put off to tomorrow what can done today. Continue to reach for the stars. Continue to dream.